OUR MOST RECENT PROJECT - SUMMER VIBES - DID NOT ALWAYS LOOK AS COLORFUL AND COZY :) APART FROM THAT, WE HAVE REMOVED ALL THE FURNITURE, FLOORS AND DOORS, WE HAVE ALSO REMOVED THE WALL, THAT WAS SPLITTING THE KITCHEN AND THE LIVING ROOM. THE TWO AREAS SEPARATELY WERE TOO SMALL AND THROUGH THE HIGH NUMBER OF DOORS TO EACH OF THE ROOMS, THE CORRIDOR LOOKED LIKE A WAGON WITH COMPARTMENTS. AFTER THE WALL WITH THE DOORS TO THE KITCHEN WAS DEMOLISHED, WE ACHIEVED A BEAUTIFUL, OPEN SPACE, THAT HAS BEEN DIVIDED BY A SCANDINAVIAN KITCHEN ISLAND. THANKS TO THAT THE CORRIDOR WAS OPTICALLY INCREASED AND DUE TO THE FACT IT WAS OPENED ALSO THE LIVING ROOM GOT OPTICALLY LARGER. THE FLOORS IN THE FORMER ROOMS HAVE BEEN TEARED OFF AND REPLACED WITH CLASSIC GRAY TILES AND BEAUTIFUL PANELS IDEALLY IMITATING NATURAL WOOD. AS IN MAJORITY OF ALL PROJECTS THE KITCHEN CONSTITUTES THE HEART OF THE WHOLE HOUSE. 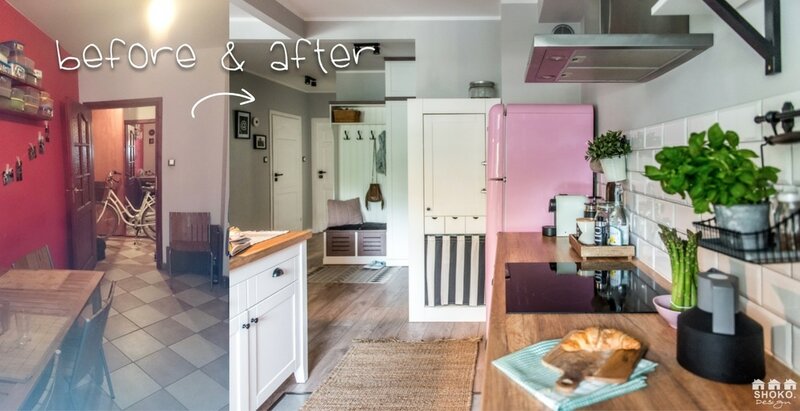 THIS PROJECT HAS BEEN STARTED A BIT DIFFERENTLY THAN ALL THE OTHERS, AS THE INVESTORS TOLD US AT THE VERY BEGINNING, THAT THEY BOUGHT ONE ELEMENT, THAT RATHER MASSIVE MIGHT INFLUENCE THE FINAL DESIGN OF THE KITCHEN - A PINK SMEG FRIDGE! :) AS YOU MAY THINK, THAT DID NOT WORRY US AT ALL, RATHER THE OPPOSITE! WE TOOK THE CHALLENGE UPFONT, AS WE LOVE SMEG FRIDGES AND THEIR DESIGN. :) THE OWNERS WANTED A VERY BRIGHT AND SCANDINAVIAN KITCHEN, SO WITHOUT FURTHER THOUGHTS WE HAVE CHOSEN CLASSIC WHITE AND WOOD AS MAIN MATERIALS. ON THE WALL NEXT TO THE SINK WE HAVE USED OUR FAVORITE SUBWAY TILES IN CONNECTION WITH BRIGHT, RESISTANT GRAY PAINT TO THE KITCHEN AND BATHROOMS. WE RESIGNED ON THE SET OF HANGING SHELVES OVER THE COUNTERTOP, IN ORDER TO MAKE THE KITCHEN LOOK DIFFERENT THAN THE ORDINARY KITCHEN DEVELOPMENT AND TO MAKE IT SMOOTHLY COMPOSE WITH THE LIVING ROOM. TO MAKE A FULL USE OF THE WALLS, WE HAVE HANGED RAILS WITH BASKETS TO STORE COOKING SPOONS, HERBS AND SPICES. 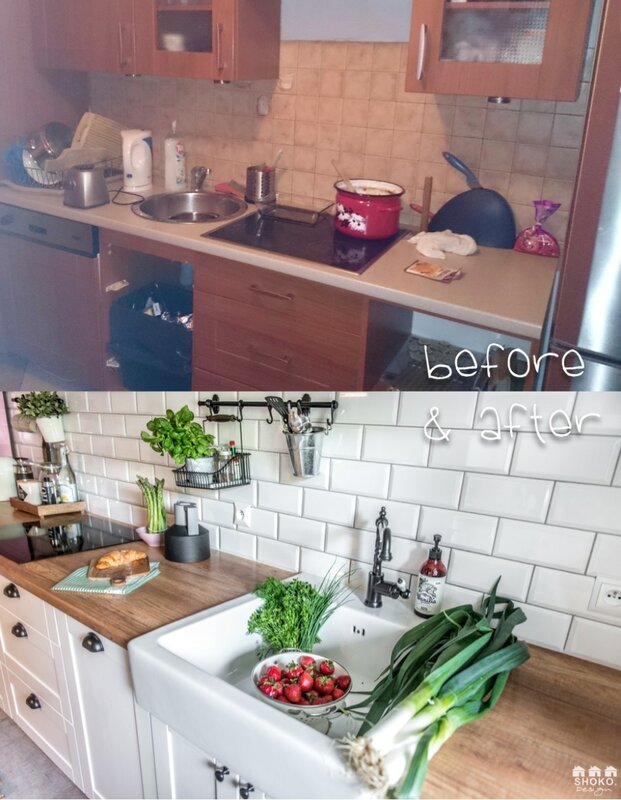 THE OLD STEEL SINK HAS BEEN REPLACED WITH A BEAUTIFUL, SPACIOUS, CERAMIC SINK WITH BLACK TAP. TO THE TO THE SIMPLE WOODEN FRONTS WE HAVE ADDED HANDLES IN THE SHAPE OF BLACK MUSHEL. ON THE PICTURE ABOVE AND ON THE LEFT SIDE YOU MAY SEE THE SHOTS FROM THE CORRIDOR, WHERE YOU CAN SE THE OLD FUNCTIONAL LAYOUT WITH THE SPLIT FOR TWO SEPARATE ROOMS. ON THE RIGHT SIDE WE PRESENT NEW OPEN SPACE.